Green changed to yellow right at the beginning of the intersection, and by all the rules of driving in any country in the world, I had to stop. I confidently hoped to slip through this intersection before the traffic light turns red. And when I sped away, in the viewing mirror I saw how the GARDA car was driving right behind me, and of course, I was shown to turn left to the side of the road. I am very recently in Ireland, and this is my first acquaintance with the Irish police. I got out of the car, showed my license, and I don’t know, but for some reason, tears flowed from me. Represent a picture? The car is an adult woman, obviously a foreigner, crying, and it is clear that a conversation with GARDA does not promise anything good for her ... I can’t lie, honestly give my address and ask timidly: - "What is the amount of the fine?" To which a deadpan police officer politely replies: "80 euros." Then this amount seemed to me very large .. The policeman wrote down my address, examined my car and returned the license to me, allowed me to move on. I thanked, said quietly: "I am very sorry, Sir" - and went about my business further. There were days that turned into weeks, then months, but in my inbox I didn’t see any documents to pay my fine. They just did not send me. As I believe, that poor, sobbing foreigner, that policeman just regretted, apparently not wanting to spoil my impression of his country. I still remember him, sincerely grateful to him that my recklessness got away with me, and therefore I try to behave as worthily at the wheel as I can. In the Irish police there are all kinds of patrol. Which are only possible if the country is not in a state of martial law. Walking patrols of a group of three or two policemen, usually men and women, patrolling roads especially during rush hours on cars and on ubiquitous and nimble motorcycles, and the most honorable and beautiful is probably mounted police that serve not only the city, but Phoenix Park, where the stables are located. And it should be noted that the horses are not caring for the horses, but the police themselves, so as not to lose contact with the animals. Who knows what service they will have to perform next time together ... And at night in the sky, police helicopters often stand guard. For some time I worked as a translator in the courts, and it was interesting for me to observe a different order of the internal organization of the court session, compared to our courts. There is a judge, the accused and his defender, but - there is no prosecutor, but this function of the prosecution, or more precisely, the story of a crime, is assigned to ... GARDA. The policemen stand at the opposite defense of the wall in the courtroom, and when the accused is called, that policeman, to whom his case fell from the very beginning, presents the judge with all the facts of the crime. It is not often that such minor matters as the collection of a fine, you really have to disassemble the judges. Violators of the order try to pay the fine earlier or before the start of the trial, the police officer reports on the payment to the judge and the case is closed right in the courtroom. I am offering you to read my article for '' Nasha Gazeta'' - an interview with a GARDA officer Mrs. Mary Gormley. Mary Gomley, a nice and friendly Irish woman, tried to answer in detail many of the questions that interested me, understanding how important it is to convey as much useful information as possible for Russian-speaking readers. Mary Gormley believes that many crimes and offenses are easier to prevent if citizens of the state are aware of how the police work, for which they can be punished with a fine, and for which they can go to jail. Engage members of all ethnic groups living in Ireland today, and in particular Dublin, to cooperate with the police, help its employees prevent crimes, conduct explanatory work among emigrants — to this end, public forums took place in GARDA in March and May 2012, and they discussed the problems faced by the police, patrolling the places of residence of immigrants, and questions: how to solve these problems in advance, without bringing people to civil or criminal liability? -Mary, how would you describe the situation in your work today? Has something changed with the increased number of immigrants? -There will always be a lot of work, regardless of whether the percentage of crime in Dublin is high or not. Crime prevention is the most important part of our work, especially now that people from different countries come to Ireland, where there is a different legislation than Ireland. To acquaint new residents with our orders and laws is the main goal of our meetings with representatives of different ethnic groups in Dublin. The center of the capital, where all newcomers are striving, mainly due to job searches, is the most restless and criminogenic part of the city. The highest unemployment is precisely here, and the lowest level of living compared to other areas of Dublin. The indigenous people, I mean the Irish, usually live in prestigious areas, resort areas or rural areas, and they only come to work in the center of the capital. There are areas where only the upper class lives - the well-to-do segments of the population, and the situation there is, of course, completely different, people can leave their cars without closing, and no one will harm their property, and they all know each other. -I know that the mayor of Dublin was present at one of the forums. What kind of help can we get at the City Council? - The city council, as well as we, the police officers, is ready to render any assistance to immigrants. To achieve maximum feedback and understanding between new communities - the communities - and the Dublin City Council is our task. What worries you, what does not like and what does not work in a new life for you here - come and give your opinion to us or to the city council. Many immigrants become victims of fraudsters because of ignorance of certain things or because they are too gullible, criminals "break open" other people's bank accounts, forge credit cards, promise to do a good job for a fee, or by issuing a PPS (personal code for which every citizen is taxed) with the help of an unfamiliar person, people pay a tax for another person, not suspecting anything. Unfortunately, there are many such cases. With crimes of this kind, we are helping to understand, and in addition to this, we told in our forums about what tricks the fraudsters use today. And an employee of one of the banks held a very important, in my opinion, presentation, telling all about the protective measures that a credit card should have, and how to protect your bank account, and everyone present could see it on the screen. -In my country, the police always have a precinct policeman who is assigned a certain area, and he constantly patrols him, this is especially true for dysfunctional families. -“GARDA also has such departments, we call them" community police ". And our employees are also responsible for their site in each area of ​​the city. At their disposal - high-speed cars, excellent communication and helicopters patrol those areas where the situation is especially restless. These are very effectively working departments in our police for the timely prevention of many "domestic" crimes. - And what offenses do immigrants commit in most cases? - I would not say that immigrants cause us more trouble than our citizens. People mostly come to work, and this is obvious. The only bad thing is that they often have only 300-400 euros in their pockets, for various reasons they cannot immediately find a job and start stealing food. These cases, unfortunately, occur most often. Well, prostitution among young girls coming to Ireland. The same problem - inexperienced young people are not able to adapt quickly, plus ignorance of the language, lack of friends, relatives. When you start talking to them, you just wonder - some come to the “bare place” - neither friends nor acquaintances in Ireland, all this pushes them to such “earnings”. For many months, a special department was engaged in the search and collection of evidence against residents of Nigeria and other countries who came to our country to do business in prostitution and attracted women from the Baltic region, from those areas where people could not get any work at all. It was very difficult, because the criminals changed their cell phones, changed the addresses of the dens, covered their business activities with massage parlors. But this long-running operation was successfully completed, and in Dublin a whole network of organized sale of women to this dirty business was revealed. - And what punishment follows if a thief or a thief gets food for the first time? - What can be the punishment of a hungry person ... If this is, of course, not professionals in the criminal world who simply decided to change the region of their "work". We try to help, we send them to those state organizations that deal with issues of assistance to immigrants. Unless, of course, this is a repeated case or a deliberate theft, which for some in our country becomes a "profession." - Are there many cases related to the drug business? In Latvia, for example, a lot of young people trade in this "profitable" business. Have our compatriots added jobs to you? -Unfortunately, this information is confidential and I cannot directly answer your question. Let me just say that your people do not deliver us the trouble of selling and using drugs to the extent that our citizens do. There were only isolated cases in my practice, when we sent cases of citizens of former Soviet republics to court. This business, speaking of immigrants, is flourishing among Africans living in Ireland, as one of the routes of drugs to Europe travels from Africa, and we naturally try to resist it. 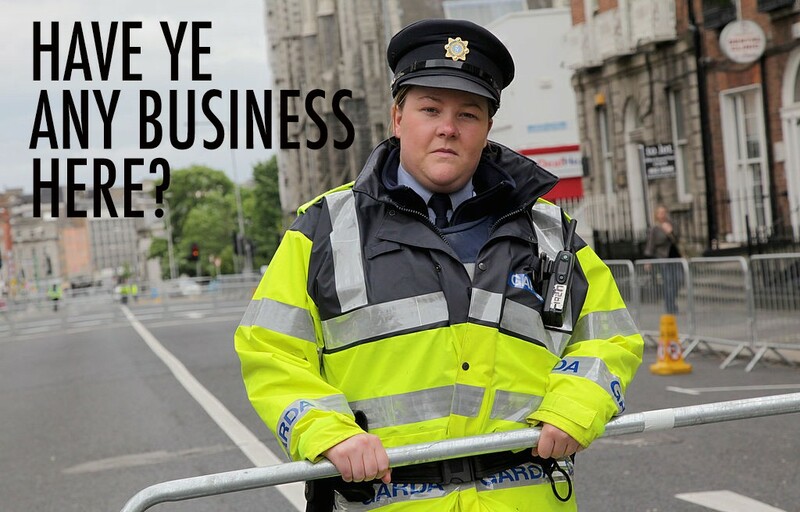 - Mary, what would you like to say to our readers and what to wish for as an Irish police officer? - I want to remind once again: do not shut yourself in your misfortune, if it happened, do not stay with your problem, do not think that you are only strangers here. We Irish people are very hospitable people and it is our custom to help our neighbors in the nearby house. We still remember those hard times in our history when our ancestors had to leave their homeland and settled around the world. We remember this, and therefore it is easier for us to understand each other, because we had the same problems once ... Do not hesitate and ask for help from your Irish neighbors, and come to the local GARDA offices before you happened trouble, we will always help you and together we will find a solution to your problems.